Bell’s beer is one of the best known and largest craft breweries in the country. Famous for big beers like Hopslam and Expedition Stout, the Amber Ale is one of their oldest and most conventional offerings. Even though it is available year round and has been brewed since 1985 I’ve never tried this beer. 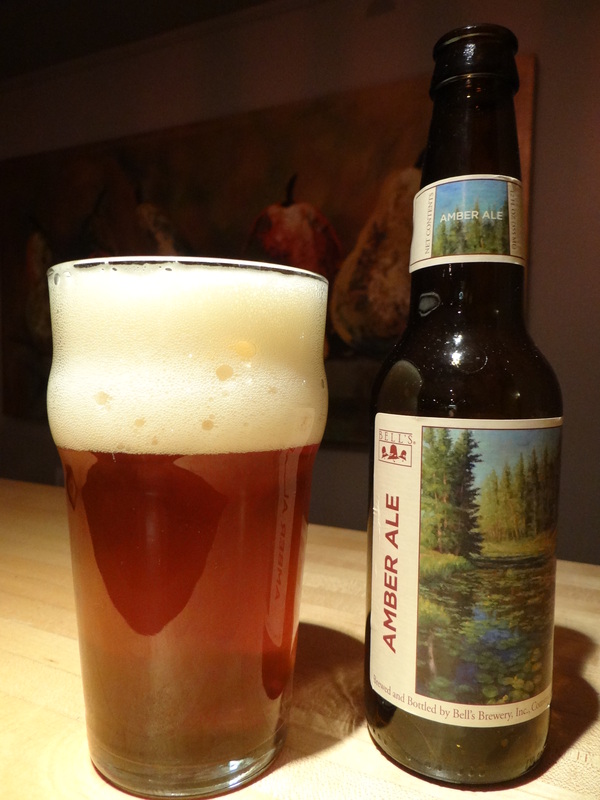 In fact, I’ve passed it by hundreds of times without even noticing it, but when I was looking for a Michigan brewed Amber Ale (to go up against Elevator’s Bleeding Buckeye in my recent Ohio vs. Michigan taste test) it was pretty much the only option. This 6-pack was exceptionally fresh, being bottled only 2 weeks ago. This beer has a hazy, golden color with a big creamy head (2-3 fingers). The head retention and lacing are impressive. I give this beer high marks for appearance. The smell and taste remind me more of a lager than an ale. Toasty, bready malts with a hint of sweetness, not too sweet mind you, but the hops are buried pretty deep. If there are any fruity byproducts from the Ale yeast fermentation I didn’t notice them. It does have a nice creamy mouthfeel and is very easy going down. This strikes me as a gateway beer for someone who is converting from macro lagers to craft beers. The craftsmanship put into this beer is high, but the goal doesn’t seem terribly ambitious. Maybe the fact that it dates back to 1985 when you didn’t have to brew beers with New Zealand hops, Westmalle yeast, or cacao nibs to stand out from the crowd, is a clue to why Bells takes a rather conservative approach with this beer. I will say it was pleasant enough to drink, but nothing to get too excited about. Since it is approaching 30 years on the market it must sell well enough for Bell’s to keep making it. If you are throwing a party or having company that is averse to most craft beers this is one that you and they can both appreciate. I did mark it down a notch because it is looks and tastes more like a golden lager than an amber ale. 10 = perfection, 9 = excellent, one of the top beers in the world, 8 = very good, one of the top beers in its style category, 7 = good, a solid beer I’m happy to be drinking, 6 = average, not bad but not something I’m likely to buy again, 5 = below average, 3-4 = poor, should be avoided, 1-2 drainpour.